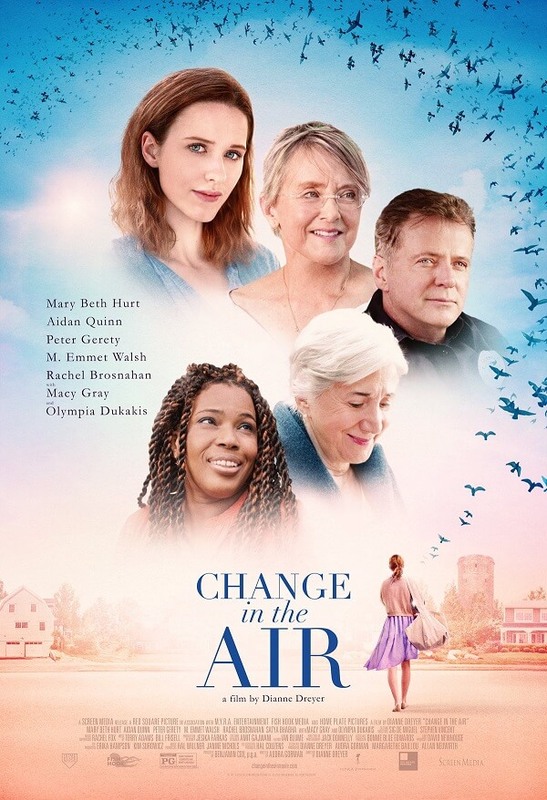 There’s a ghost in Dianne Dreyer’s movie, but “Change in the Air” has nothing to do with Halloween. Nobody gets stabbed, hacked, beheaded, shot, guillotined, or drawn and quartered. True, one old guy gets run down by a car, but no problem. He comes back to life, only to painlessly die of a heart stoppage. The only horror in the pic is the suburban community, a quiet place where doors are unlocked, neighbors barge in, mail is delivered on time, the cops are unlikely to ticket the neighbors they know. In fact it is so quiet and peaceful that I’m reminded of the best in line (not an exact quote) in this year’s best drama so far, “Can You Ever Forgive Me?” (Melissa McCarthy in an Oscar-worthy performance), “He died, Or moved to the suburbs. I can’t tell the difference.” Don’t see this movie one day after you see the McCarthy gem. “Can You Ever Forgive Me?” will make much of what follows mediocre or, in the case of “Change in the Air,” pretty terrible. As Wren, Rachel Brosnahan is ideally cast since the young actress is an ethereal presence with her light blue eyes and her light clothing and face so white you might holler at the screen “Just put on a sheet as long as you insist on playing a ghost.” We may wonder why she’s hiding from the police, who knock on her door only to find her hiding in the house (even though she presumably could disappear or turn into a bird). Her next-door neighbor Jo Ann Bayberry (Mary Beth Hurt) tells her ornithologist husband Arnie Bayberry (Peter Gerety) that she’s lovely—three or four times. Since Wren receives a full bag of mail daily, Jo Ann wonders whether she’s a speed-reader. She can’t resist allying with Josh (Satya Bhabha), the local postman, convincing him to join her in stealing a couple of letters and reading them. The only person who is not nosy, Walter Lemke (M. Emmet Walsh), spends the movie time sitting and manspreading in a chair on the lawn. No dialogue from him, which is fine. It’s no secret that Alison (Rachel Zeiger-Haag), Jo Ann’s daughter, had passed away since, of course Wren knows all. The only real conflict finds Moody (Aidan Quinn), the cop, arguing with the pharmacist who does not want to fill his script because it’s 6.01p and the pharmacy division closes at 6. How does Wren shake up the town and wake up people who would come to life in an apartment in a thriving metropolis? If it’s by a quick scene of magic realism in the end, I guess that would qualify. If it’s another action, I must have missed it by dozing for the wrong half-minute. If you read this carefully, you’ll know the antidote, one that will shake you up and maybe have the same effect on the suburban town. Go see “Can You Ever Forgive Me?” It will restore your faith in the movies.